“Hill 60,” by Nigel Cave, is one of the Battleground Europe books. Hill 60 — named because it was 60 meters above sea-level — is in the Ypres Salient, not far from Zillebeke. It was the scene of especially ferocious fighting during Second Ypres, in April 1915, where the British set off some of their earliest mines, and the Germans used some of their earliest gas. The Hill ended up in the hands of the Germans, who stayed until June 7, 1917, when the British set off the mines they had dug under the Messines ridge, including Hill 60. The explosion of the mines was said to be so loud, it was heard in London. Cave says 10,000 Germans were killed in the Battle of Messines. I predict we will all take a much greater interest in mining on the Western Front when “Birdsong” comes to PBS in April. Battleground Europe books are not for readers focused on the whys and wherefores. But they are unmatched if what you want is the who, what, when, where and how — unity by unit, even hour by hour. This entry was posted in Battles, Books, Ypres and tagged mining by World War One Historical Assn. Bookmark the permalink. I am not sure if it’s at Hill 60 but I once saw something on TV and some of those mine never exploded and are still buried in the ground, in their holes that are now filled with water. In 1955, a cow got struck by lightning, which plunged into the ground and set off a mine. Some surprise for the farmer, right? I think there’s only one live one — well, I assume it’s live — left under the Messines ridge. The photo of the mine crater is one I sent Susan and asked her to post. 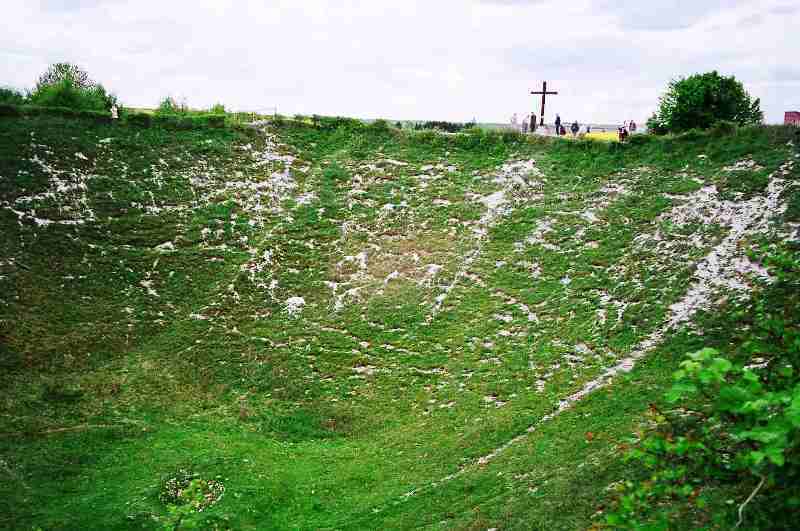 That is the Lochnagar Crater and it is one of the few photos I was able to take that could give a feeling for the scale of the thing (look at the people along the rim in the back).